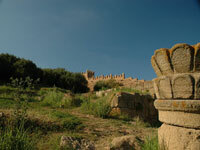 Emerging from the boulevards of the Ville Nouvelle (New Town) of Rabat, one comes across the ruins of Chellah, once the thriving walled Roman port city of Sala Colonia, abandoned in 1154 in favour of Salé across the river mouth. In the time of the Almohads the site was used as a royal burial ground, and following this, the Merenid sultan, Abou El Hassan, added some monuments and the striking main gate in the mid-14th century. Just inside the gate are Roman ruins dating from 200 BC, which include a forum, a temple and a craftsmen's quarter. The citadel is now part of a garden and in spring the ruins are surrounded by a beautiful variety of flowers. The Chellah Gardens are entered through an ancient gateway created by the Almohads and notable ruins inside, apart from the Roman remains, include what is left of the small mosque dedicated to Abou Youssef, several elaborate tombs, and a stone minaret in the centre of the grounds. Visitors are welcome to wander freely and none of the ruins are off limits. The garden is a lovely place to spend some time and since 2005 has been the venue of an annual international jazz festival, Jazz au Chellah.